The European Union has launched a fresh crackdown over taxes paid by tech giants Amazon and Apple. The Commission also plans to take Ireland to court over its failure to collect €13bn of back taxes from Apple. 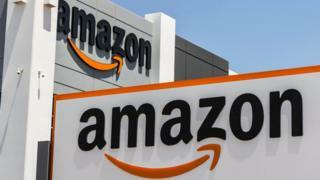 Amazon denied it owed any back tax, saying it did "not receive any special treatment from Luxembourg". "We will study the Commission's ruling and consider our legal options, including an appeal," an Amazon spokesperson said. But European Competition Commissioner Margrethe Vestager said the Luxembourg arrangement meant that Amazon had been allowed to pay "substantially less tax than other businesses", which it said was "illegal under EU state aid rules". "Luxembourg gave illegal tax benefits to Amazon. As a result, almost three-quarters of Amazon's profits were not taxed," Ms Vestager added. She said Amazon paid four times less tax than other local companies. "Member states cannot give selective tax benefits to multinational groups that are not available to others," she added. Image caption The Commission said until the taxes were recovered Apple was still "continuing to benefit from an illegal advantage"
Meanwhile, the Commission said it planned to refer Ireland to the European Court of Justice for failing to recover €13bn in back taxes from tech giant Apple. It concluded last year that the US firm's Irish tax benefits were illegal, enabling the firm to pay a corporate tax rate of no more than 1%. The Commission said that more than a year on from that decision, Ireland had still not recovered the money. As a result, it was referring Ireland to the European Court of Justice, it said. Ireland, which has contested the decision, claiming that EU regulators were interfering with national sovereignty, said the decision was "extremely disappointing". "Today's decisions are to order Luxembourg to recover unpaid tax from Amazon and refer Ireland to the European Court for failing to recover unpaid tax from Apple. I hope that both decisions are seen as a message that companies must pay their fair share of taxes, as the huge majority of companies do," said Ms Vestager. The decision on Amazon follows a three-year long investigation by the European Commission, which said in 2014 that it had suspicions the arrangement had broken EU rules. The tax deal between Luxembourg and Amazon was struck in 2003. The Commission said it had enabled Amazon to shift the "vast majority" of its profits from Amazon EU to Amazon Europe Holding Technologies, which was not subject to tax. It said this arrangement had "significantly reduced" Amazon's taxable profits. At the time the deal was struck, Jean-Claude Juncker, the European Commission's president, was the prime minister of Luxembourg.